For many years Next has been a very profitable retailer of clothes and homewares. Like most of its peers it has had to face up to the changing world of shopping that has led more people to buy stuff over the internet instead of from shops on the high streets or in retail parks. Profits from its retail stores have been falling as a result. 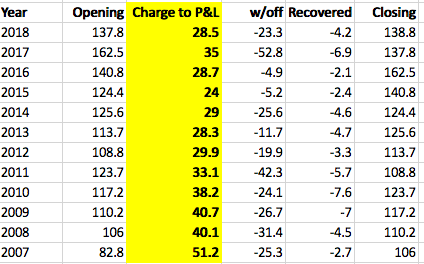 Next is in a better position than most to cope with these changes. It is in no danger of going bankrupt and has not signed itself up to long-term rental commitments that are difficult and expensive to get out of. It has a very good plan to manage the decline of its stores and generate positive cashflows in doing so. The good news is that Next has one of the best retail internet businesses out there. It has built on its established Next Directory brand and has been going about trying to build an increasingly valuable online business. Is it too reliant on credit customers? This is very much a number crunching exercise to answer these specific questions and is deliberately not intended to be a detailed business analysis of Next and its online business. How does Next make money and how has it been performing? Next Online sells clothes and homeware products over the internet to customers. It is also a finance business as well. Customers can buy goods on credit using a Nextpay account to spread the cost. As of January 2018, the business had 2.5 million active credit customers. If the customer pays their outstanding balance in full when due then no interest is charged. After the interest free period, they pay interest at an average annual percentage rate of 22.9%. Interest income was £223.2m last year or just under 12% of total sales. As well as selling its own brands, Next also sells the brands of other companies as its very efficient distribution network means that it is often cheaper for them to sell through Next rather than going it alone. This works well for Next allowing it to offer a broader range of products to its customers. The Online business has built up a significant overseas presence as well with just under a million active customers. This part of the business contributed £65m of operating profits last year. Sales growth for the online business has been reasonable and picked up last year. Although profit margins have come down slightly, the business is very profitable with margins of 24.4%. The 2018 annual report gives readers a bit more insight into the profitability of the business. We can see that the retail part of the business is still very profitable with profit margins of 18.4%. What is revealing is how profitable the finance part of the business is. £223m of finance sales turns into £154m of operating profit – or £119m of pre-tax profit when interest costs are expensed. The finance part of the business accounts for a third of the total operating profits and 28% of its pre-tax profits. It is clearly an important source of profit. Next finances its credit to customers by borrowing. Over the last few years, the gap between the interest it receives from credit customers and what the interest it has to pay its lenders – its net interest income – has been getting bigger. Since 2014, its net interest income has increased by more than 50%. Is Next Online too reliant on credit customers? Next’s annual report gives the reader some information to help them try and work out what proportion of its online retail sales are made by customers using credit. We can work out credit sales by multiplying the average credit account customers by their average sales made per account. This gives an estimate of £1,130m of sales on credit in 2018 or 68% of total online retail sales. Doing the same calculation back in 2014 suggests that virtually all the retail sales were made on credit. So why has the proportion of sales fallen so much since then and does it make sense? Well, the number of credit customers has actually fallen since 2014 but showed some signs of stabilisation last year. In the meantime, the number of cash customers – who don’t use credit – increased from 0.9m in 2014 to 1.5m last year. The other main reason for the decline in credit sales has been the very strong growth from the sales of third party brands through the LABEL business. This includes wholesale and commission revenue which in combination have doubled since 2015 and are expected to grow by a further 30% in 2018/19. So Next Online is still very dependent on credit sales but nowhere near as much as it used to be. But do credit customers pay their bills? Again, the annual report gives the reader some useful information to help answer this question. A figure is given for customer receivables and the amount provided by the company for doubtful debts that might not be repaid. We can see from these numbers that the percentage of customer receivables that are subject to an allowance for doubtful debts has been coming down with the actual size of the allowance virtually unchanged at £138m last year. However, to get a better picture it is helpful to see how the provision has moved over time. One thing to point out is that not all credit sales and customer receivables are related to the Online business. Some customers use nextpay in store. That said, the analysis is still useful as it gives the investor an insight into credit risk and how it changes over an economic cycle. A charge to the income statement (P&L). This is the amount of doubtful debt that reduces a company’s profit. This increases the allowance for doubtful debt. In 2018, Next’s profits were reduced by £28.5m due to increases in doubtful debts. Debts written off – this is the amount of debt that has previously reduced profits that the company decides it cannot collect. This reduces the allowance. Recovered – doubtful debts that have previously been allowed for but have been recovered. This reduces the allowance for doubtful debts and increases profits. In 2018, Next’s profits were increased by £4.2m due to the recovery of previous doubtful debts. I’ve gone back to 2007 and looked at the movement of the doubtful debt allowance to get some feel for how debts move around during an economic cycle. We can see a very large reduction in profits in 2007 and for the years to 2010 which show that customer debts can be a problem when the economy turns down. Taking this a stage further we can look at the reduction in profits coming from doubtful debts as a proportion of Directory/Online profits (if you wanted to make the assumption that all the bad debts related to that business) and as a proportion of total profits. At the moment, the impact of bad debts as a percentage of profits is low compared with the last economic cycle. When the economy turns down it is possible for bad debts to inflict a lot of damage on Next’s profits if history is any guide. Another useful check is to look at the ageing of customer receivables to see what proportion of money owed to a company in the form of unpaid invoices is overdue. Last year, 89% of receivables were not past due. This compared with 89.7% in 2017. 4.5% were more than 120 days overdue and were possibly at risk of becoming bad debts. Is Next’s Online business being undervalued by the market? The bull case for investing in Next shares is that the online business is more valuable than the retail business and is in a good position to keep on increasing in value. All I would mention in response to this is that the retail business is still a drag on the profitability of Next as a whole. This is because the reduction in store profits is not being completely offset by growth from the online business. That said, it would be interesting to try and work out what the current stock market value of Next might be implying for the value of the online business. This is not an exact science as it depends on how high or low a valuation is attached to a declining retail store business. You must come to your own view as to what valuation multiple is reasonable. 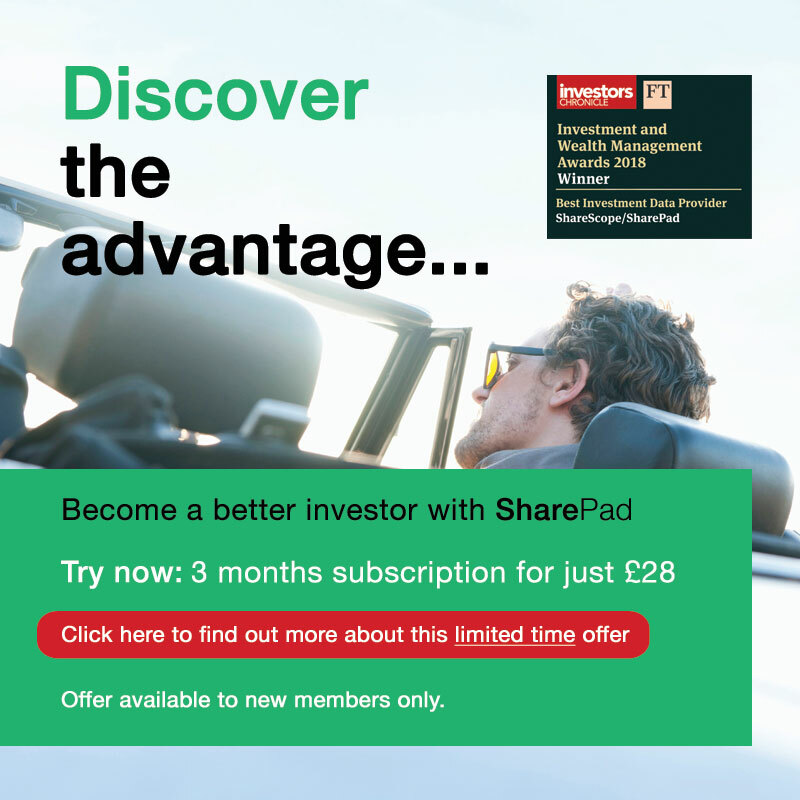 To avoid any confusion that may be caused by using forecast profit multiples – you can do this in SharePad if you want to – I am going to base my valuation of Next’s high street retail business – and other little bits – on the basis of its reported profits. Total operating profits – allocating £10m of £21.3m of central costs – were £309m last year. 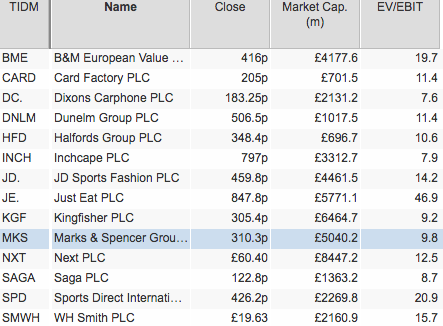 Putting this on an EV/EBIT multiple of 10 times (slightly more than M&S) to keep things as simple as possible gives an enterprise value (EV) of £3,090m. 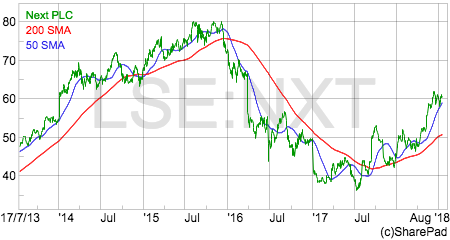 At 6,040p per share, Next’s total EV is £9,482m which means that taking my valuation for the retail bits of Next gives an implied EV for the Online business of £6,392m. 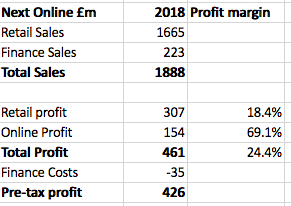 If I adjust the £461.2m of Online profits for the remaining £11.3m of central costs this gives profits of £449.9m and an implied trailing EV/EBIT multiple of 14.2 times – the same as JD Sports but less than WH Smith. This is all rough and ready stuff and open to lots of questions and criticism but this is what the research process of a business is all about. You are trying to get a feel as to whether the Online business is attractively valued or not. The higher the valuation you give to the high street business, the cheaper it will look.